What an exciting month, October looks to be!! Autumn is in the air in New England. 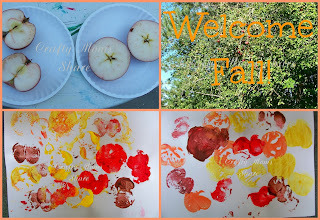 The days are cooler and the leaves are turning their beautiful fall colors. 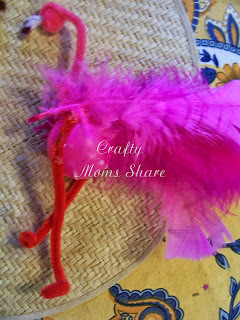 October is also the month many of us go pink for breast cancer awareness. Oh, wait, I'm already pink! However if you want to see some statistics and facts about breast cancer check out my post from a couple of years ago. 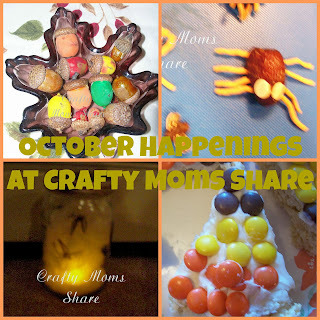 This month, I have several fall and Halloween crafts to share. Some are previewed in my collage above. 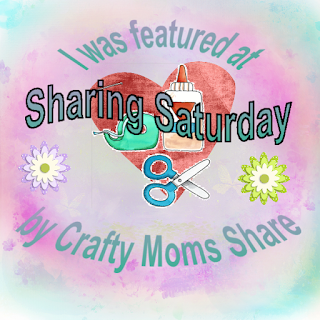 I have several reviews to do with giveaways (like my current giveaway that ends on the 6th). 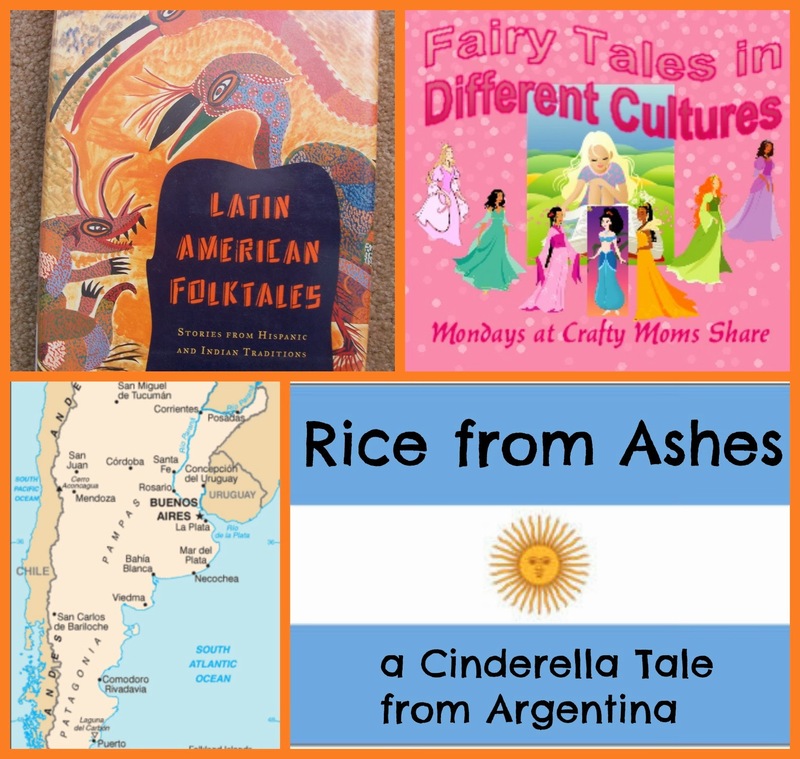 I will be continuing my celebration of Hispanic Heritage Month and will be following Multicultural Kid Blogs with their celebration of both Hispanic Heritage Month and their one year birthday celebration. I will also be posting over there this month. And of course we have our normal special events like Virtual Book Club for Kids. 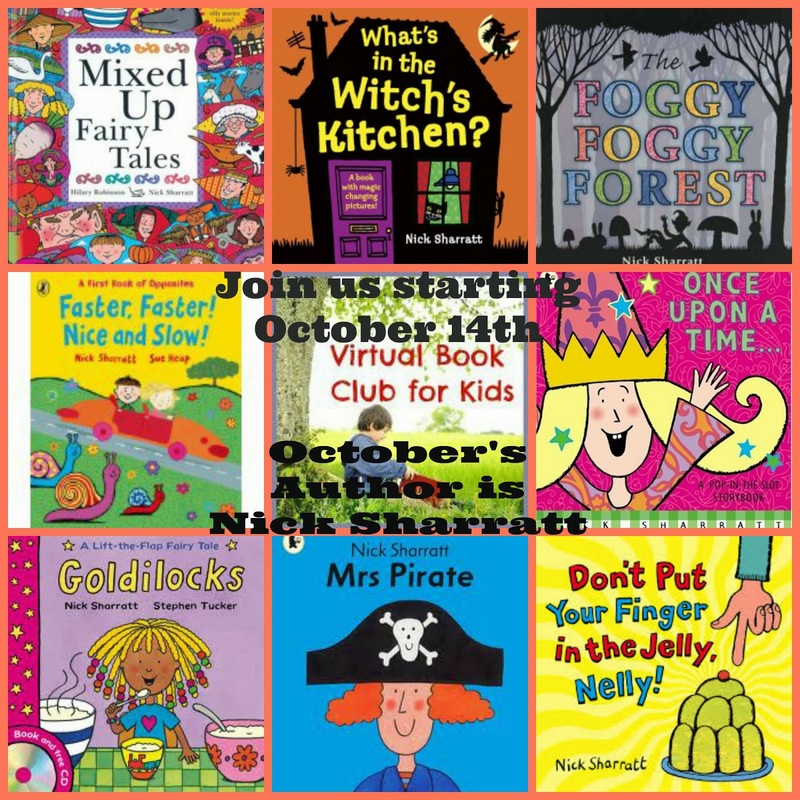 This month's author is Nick Sharratt. 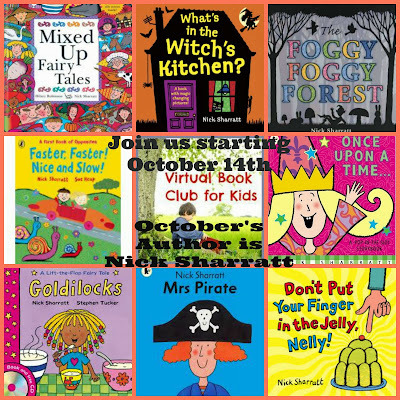 Nick Sharratt is a fun British author and illustrator. Many of his books rhyme and they tend to be quick reads. I know the few we have looked at, we have enjoyed. I hope you will join us on the 14th to see which we are sharing! 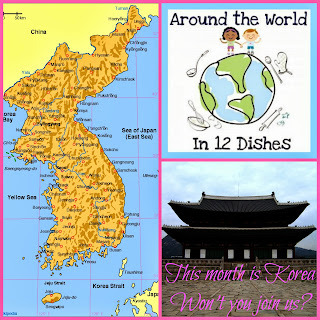 We will also be "traveling" to Korea with Around the World in 12 Dishes. If you want to have a headstart, you can get the passports and placemat for Korea already. 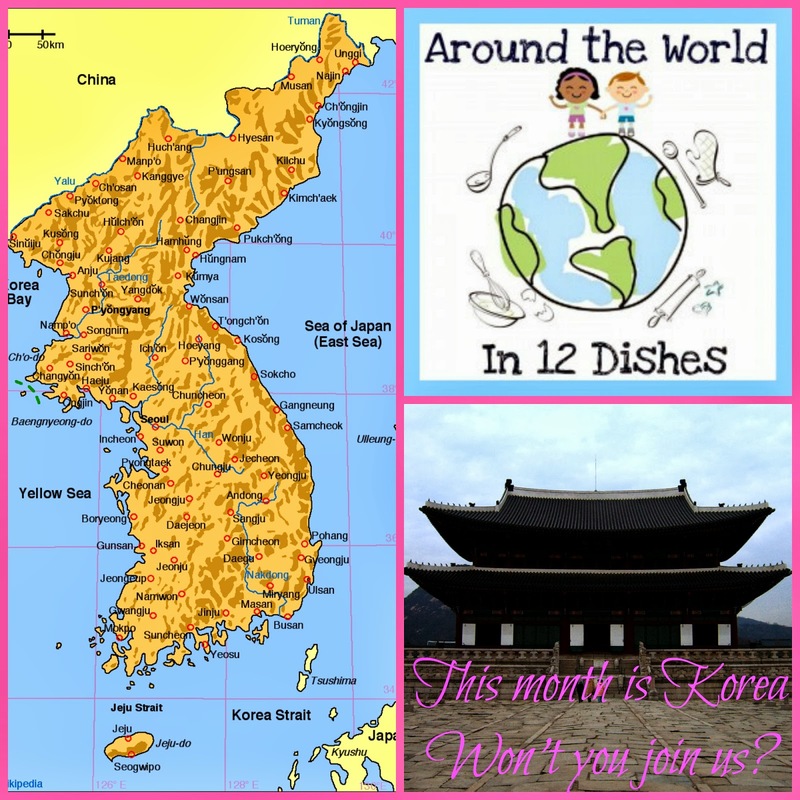 More about Korea when we use some stories and more to go with the food we try. Our post will be live October 15th. 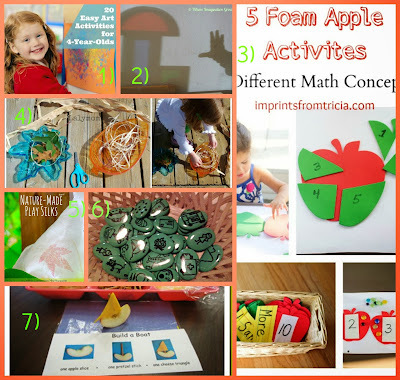 I hope you will come back to see some of these fun things!! Happy October!! 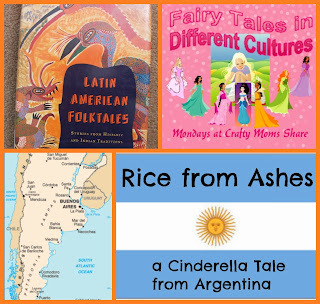 In honor of Hispanic Heritage Month, we have been sharing fairy tales from Hispanic countries. 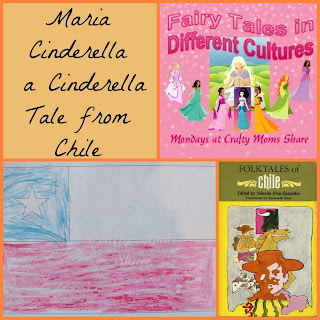 A couple of weeks ago we shared a Snow White tale from Chile. Today we are sharing Maria Cinderella. This is a Cinderella tale from Chile. I found it translated in English in Folktales of Chile edited by Yolando Pino-Saavedra and translated by Rockwell Gray. This story begins like many of the Cinderella stories. There is a widower who lives with his only daughter. Her name is Maria. Like some of the other Cinderella tales, the fire goes out and the father sends Maria to the neighbor's house for some coals. While at the neighbor's house (who happens to be a widow) the neighbor insists on Maria resting and serving her honey soup. After such treatment, Maria begins to wake early and put the fire out, so she can go back to the neighbor's for some fire and honey soup. One day the neighbor suggests to Maria she should tell her father to marry the neighbor so she wouldn't bother her all the time for fire. The father is skeptical, but Maria talks him into it, but he does warn her she will regret it. The stepmother then has a baby with Maria's father. He names the new baby girl, Maria, in honor of his first daughter. As the stepsister grows up she becomes meaner. She tells her father to send the first Maria to the field as a shepherdess. He does this. One of the cows died while giving birth to a calf under Maria's care. Maria begins to mother the calf and raise it as her pet. The stepsister gets annoyed and tells her mother that they should make Maria do more work like spinning. The stepmother takes the wool to Maria and tells her to spin it or she will pay with her head. Maria begins to cry, but the calf tells her not to and offers to spin the wool. They arrange the spindle over the calf's horns and the calf is able to spin the wool for Maria. The stepmother continues to give Maria wool to spin and the calf continues to spin it for her. The stepsister begins to get suspicious and goes to spy on Maria and the calf. She gets angry to see the calf doing all the work and tells her mother they must kill the calf. The stepsister pretends to be sick and won't get better without eating the meat of Maria's calf. The father kills the calf. The stepmother takes the intestines and cuts them into even slices. She tells Maria to take them to the stream to wash them and not to lose one bit of them. She has measured and counted them. A eagle takes off with a piece of it and now Maria is sure she is done for and cries even harder than she was with grief over the loss of her calf. She tries to follow the eagle and comes to a cottage where a woman is coming out. The woman asks Maria why she is crying. Maria tells her about the eagle who is now in the treetop near the house. The woman tells Maria to care for her children and to do some cleaning while she goes to mass and she will help her when she returns. Maria does as asked and more. The woman is very happy when she returns and gives Maria some intestine that she has plus a magic wand that will grant her anything she wants, but she is to show it to no one. Then she gives her instructions for the way home to look up and down at certain animal sounds. When Maria arrives home there is a gold star on her forehead. Maria does not know it and her stepmother tells her she is a dirty disgrace and covers her head in dirty rags. The stepsister is jealous of the beautiful gold star and schemes to get one of her own. So she and her mother put together a plan to have the stepsister do the same things. The stepmother pretends to be sick and will not get better without eating the stepsister's calf. The father kills it. The stepmother takes the intestines and has her daughter go wash them with the same instructions. An eagle takes a piece again and she follows the eagle to the cottage. The woman is walking out and they have a similar conversation though the instructions are very different to do while she is at mass. She tells the stepsister to beat her children and to gather all the junk around the house to be burned in the oven. The woman comes home and asks if it is all done. Then she gives the stepsister a piece of intestine and the opposite instructions about going home. The stepsister ends up with a big hunk of burro dung on her head. The mother is upset when she gets home with it and wraps her daughter's head in beautiful silks. The stepmother always went to church with her daughter on Sunday. Maria wondered why she could never go. She used her magic wand to have a fine coach, horse and coachman as well as a new dress to wear to mass. Maria knelt down near her stepmother and sister and the stepsister thought she recognized her, but her mother told her she was being silly. Maria left right at the end of mass and waved the wand to have everything back to normal before the stepmother and stepsister returned home. The next Sunday was the same except that Maria caught the eye of prince as she was leaving the church. The following week the prince ordered his servants to stand guard and to stop Maria before she left. One of guards caught her foot, but all he got was her golden slipper and Maria rode off home. The guards combed the town looking for a noblewoman that the slipper fit, but could not find anyone. The prince set out to the country to find her. The stepmother dressed her daughter in her finery and told Maria to hide in the corner since she was in no condition to receive a prince. She told her to get inside the oven while the visitors were there. The stepsister happened to have the same size foot as Maria, so the slipper went on easily. The prince was ready to marry her when a dog began to bark a rhyme about the burro dung on her head and the gold star was the one he wanted. One of the servants caught what the dog said and mentioned it to the prince. The stepmother tried to chase the dog away and explain it was just a nuisance, but the prince insisted on searching the house and finally found Maria in the oven. Maria told the prince the slipper was hers and that her stepsister and she have identical feet, but asked if her stepsister could produce the companion slipper. Maria went to wash up and used her wand again to be dressed the same as last Sunday and brought the companion slipper to the prince. He now knew she was his wife. The servants pulled the other Maria from the prince's saddle and beat her a bit. 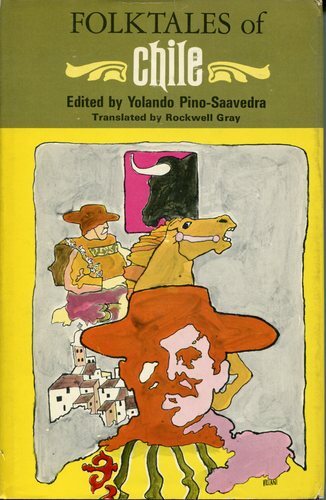 The prince asked Maria to climb into his saddle and she refused since burro dung had sat there. The prince took Maria and her father on other horses for a beautiful wedding. This story reminds me of the Spanish American Cinderella tale called, Little Gold Star. I am sure they have the same source at some point. One of the things I have noticed about the Hispanic fairy tales is the importance of the church, God and Holy Family. One of the three seem to play an important part in each one. Has your child discovered the adorable little boy in blue named Pocoyo yet? Our first experience with Pocoyo was at the end of the Peep and the Big Wide World episodes on PBS, there is a short Pocoyo cartoon. Apparently it is also on Nick Jr, but we don't watch it there. 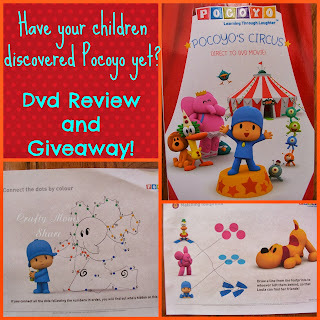 When NCircle Entertainment offered to send me a copy of Pocoyo's Circus DVD and offer one as a giveaway to one of my lucky winners, I jumped at the chance. Disclosure: NCircle Entertainment provided me with a free copy of the DVD for review purposes and the offer to give another one away. All opinions are my own. Now if you have not seen Pocoyo, it is an adorable show with an adult narrator who interacts with the characters. 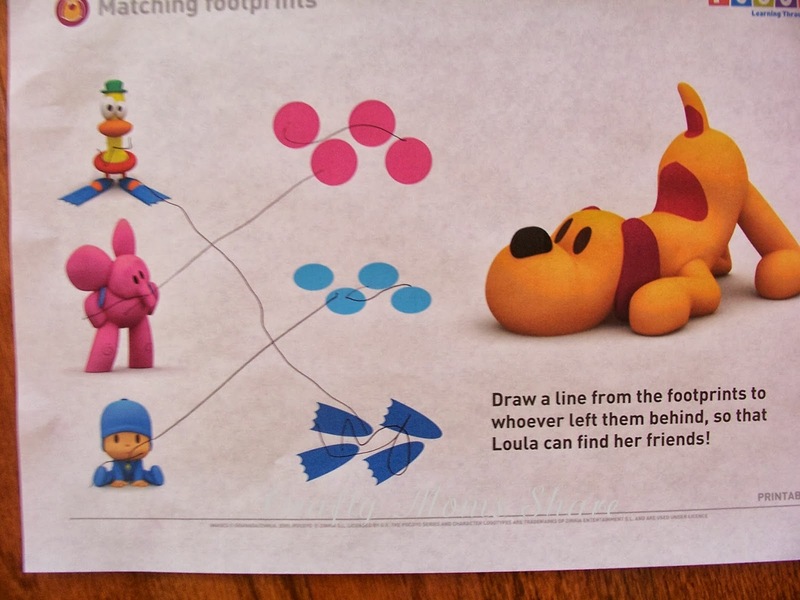 There is the little boy named Pocoyo and his animal friends. Each episode has a cute story and usually there is a life lesson in it. Pocoyo is orignally a Spanish cartoon. 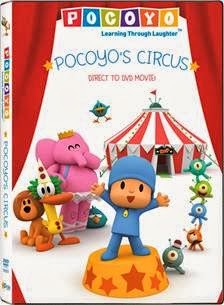 We were sent the latest Pocoyo DVD which is Pocoyo's Circus. This DVD became available in stores on August 27th for $12.99. It has eight episodes of Pocoyo available in both English or Spanish. In the first episode an alien circus comes for a visit and after some mischievous playing with their tools, the circus has to regroup, but now an angry group of aliens have come expecting to see the circus, so Pocoyo and his friends put it on. 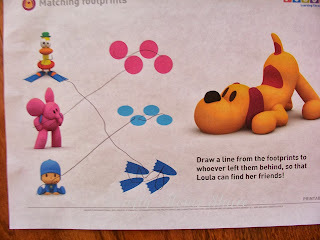 In another episode, Pocoyo and his friends are figuring out who left footprints. Once they are able to match each set to the owner, they are fine, but there are some twists and turns in the story. The other episodes are Pocoyo's Balloon, Who's Calling Me Now, Vamoosh on the Loosh, New to the Planet, Mad Mix Machine, and Remember When. Each has a lesson about listening to others, respecting others, being kind, not taking others things, and such. 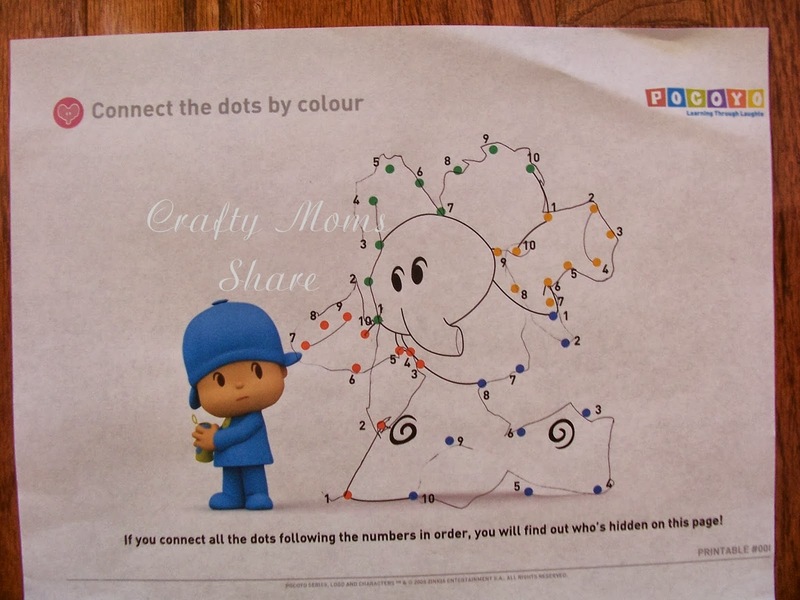 I also need to add that my mother-in-law absolutely loves Pocoyo. She actually bought one of the other Pocoyo DVDs right after we had gotten ours not knowing we had one. She bought it because she loves watching the show with Hazel. So now is your chance to win this wonderful Pocoyo's Circus DVD. It is an adorable show that children love and I know once Hazel and I get a bit better at our Spanish we will be watching it in Spanish as well. 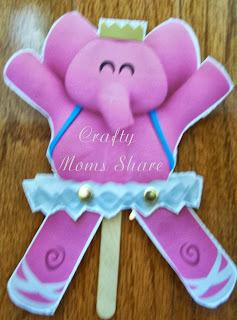 To enter please follow my Giveaway Rules and do what the Rafflecopter asks. Good luck!! Thank you to all who shared with us last week and to all who came to visit and left comments! I apologize for not getting to visit all of them yet. I was sick for a good portion of the week and then Hazel did not have school today, so I did not get my time this morning to visit. 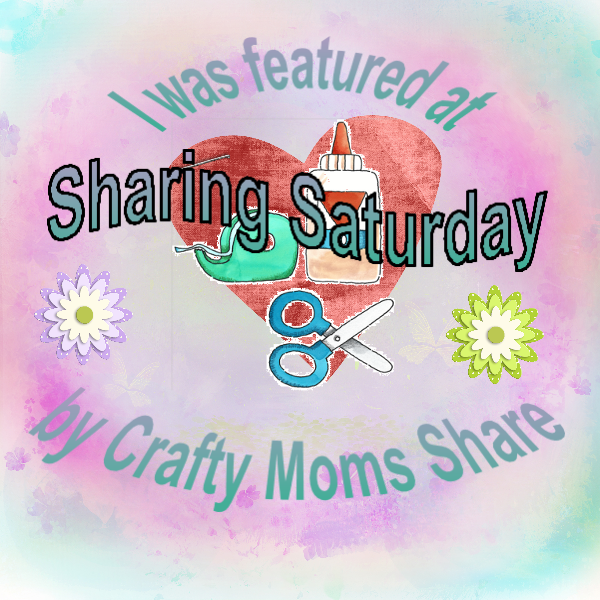 However the few I dropped in on were amazing, so I highly recommend check them all out!! 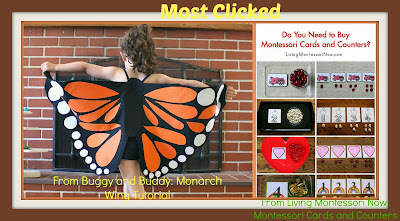 This week we had a tie for most clicked. From Living Montessori Now: Montessori Monday - Do You Need to Buy Montessori Cards and Counters? A few of the ones I loved that I visited. This week I spent several days sleeping at least while Hazel was at school, but I got a few posts up. Luckily I had some projects we had completed previously that I just haven't had time to post on (and there are still more coming). We shared a Cinderella Tale from Argentina, Apple and Nature Prints to Welcome Fall, some books to introduce hunger and activities to get children involved in fighting it, a spider web craft to go with Charlotte's Web, and our ping pong golf ball flamingos. This coming week there will be a giveaway and a product review! Plus we will be continuing our celebration of Hispanic Heritage Month and of course begin some of our Halloween posts since October will be starting! 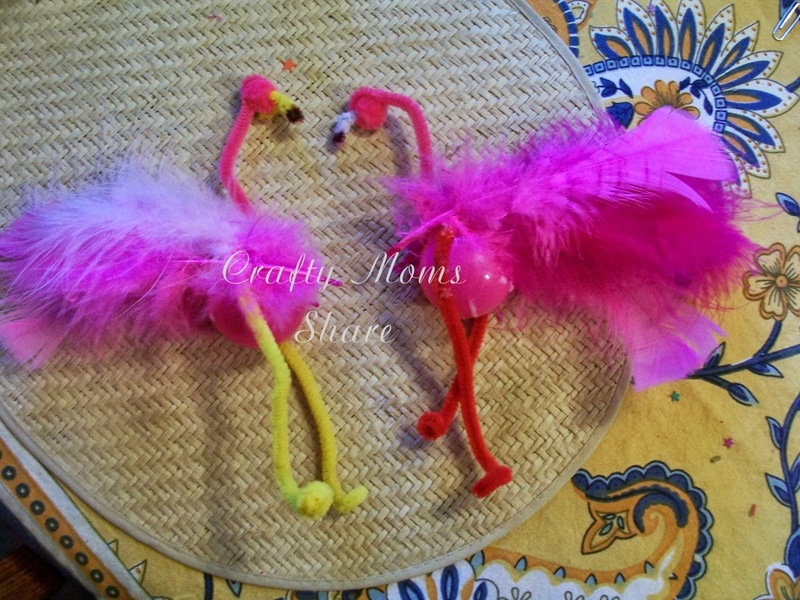 We started by choosing a color for the legs and I cut a pink pipe cleaner in half for the necks. We first glued on the leg pipe cleaner, but then wanted to wrap the neck pipe cleaner under it so we ended up regluing. 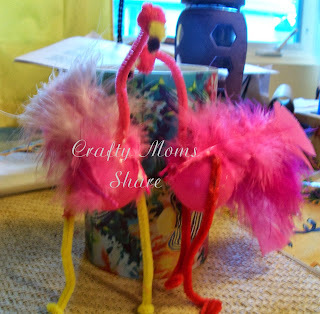 We curled the ends of the legs to be the feet. 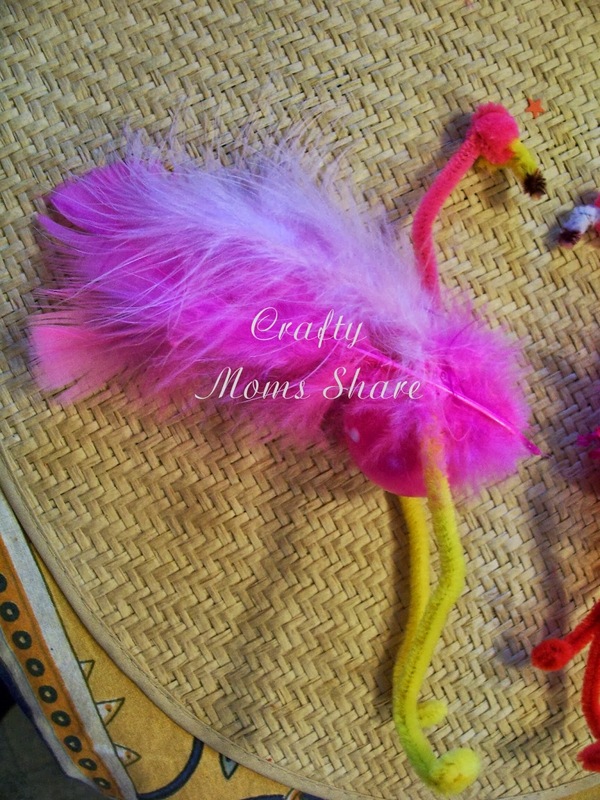 On the other end of the neck we wrapped around a pink pom pom and attached a piece of pipe cleaner to be the beak. We wrapped it into the neck pipe cleaner and twisted it to form the beak. We used a marker to add the black (well I couldn't find the black marker, so I used brown) on the ends. Then we let the glue dry. 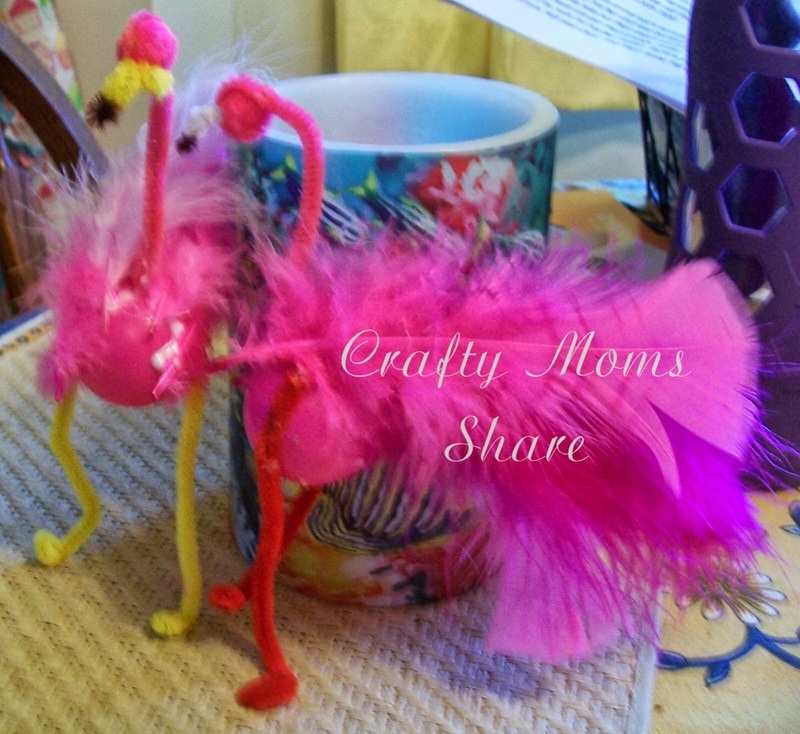 After the glue dried we glued on feathers to cover the leg pipe cleaner going around the ball and to form the tail and wings. 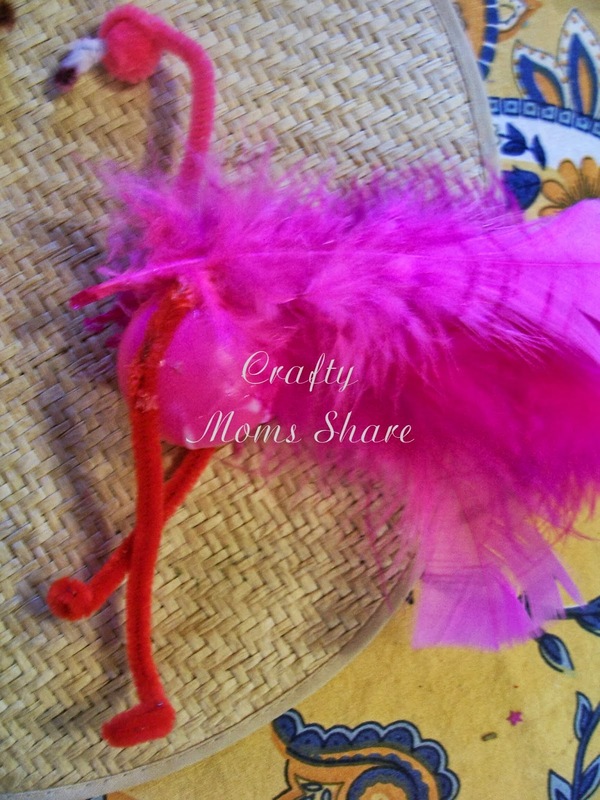 It only took two feathers on each side. The greater and lesser flamingos live in Africa, Asia and Southern Europe. The others live in South America, Mexico and the Caribbean. (Source) I will share more about each species another time, but of course we have already looked at the Andean flamingo. 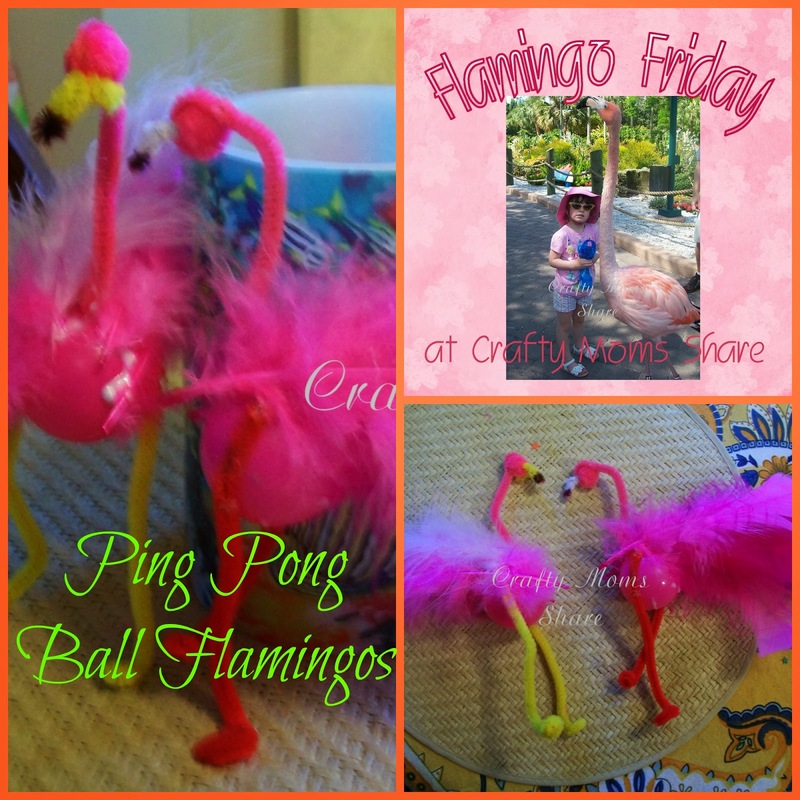 The greater and lesser flamingos are named for their sizes. The Jame's flamingo is named for the person who "discovered" the species and the others are named for one of the places they live. So that is our little flamingo craft and lesson!! Enjoy!! 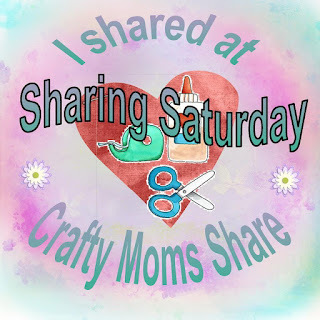 And come back to share and be inspired at Sharing Saturday!! 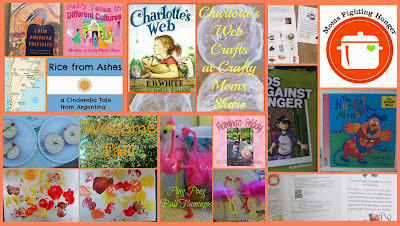 Last March and April we first read Charlotte's Web by E.B. White so Hazel would know the story before we went to see a live performance of it. She fell in love with the story and could not get enough. It is still one of her favorite live performances she has seen and that is even better than Rapunzel, Snow White and Cinderella's Wedding. 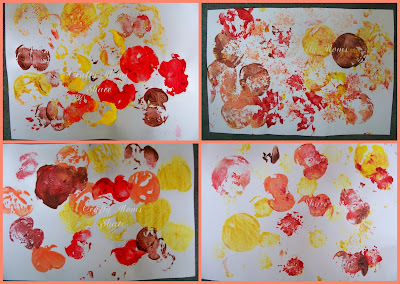 I posted about our first reading of it and learning about friendship in April. We tried a few other chapter books. We tried a Paddington Bear one since I grew up loving the Paddington series. She got bored. We tried The Lion, The Witch and The Wardrobe because I saw it suggested as a good chapter book for this age. She got scared. We came back to Charlotte's Web and read it again. 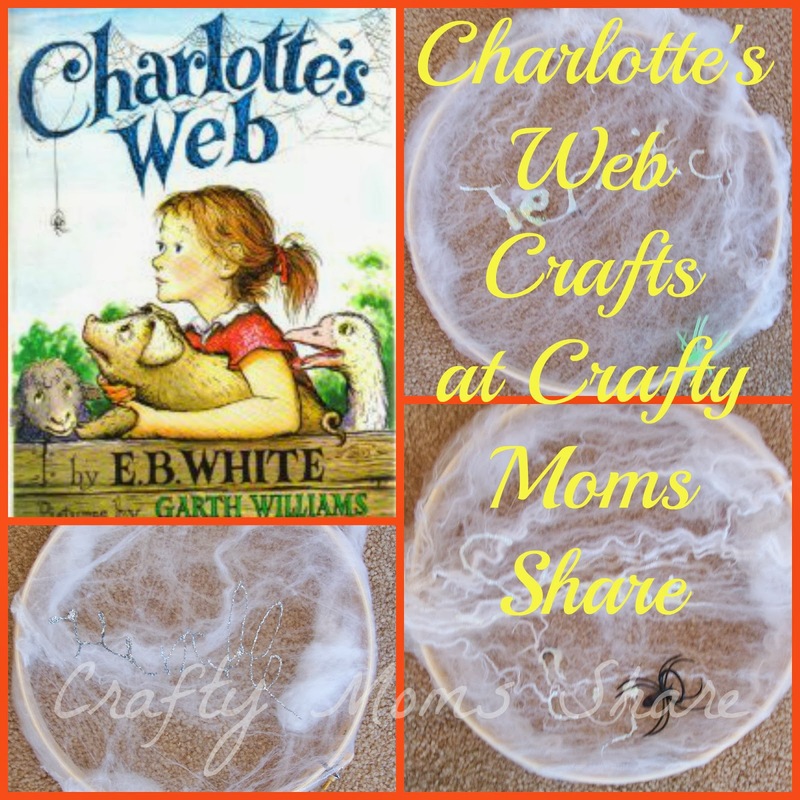 I had been wanting to do some spider crafts after reading this book since she was finally not being completely scared of spiders. Whenever she claims to be scared of one I remind her it might be Charlotte. She is getting too smart for my tricks though since the last time she reminded me Charlotte is dead. For those who do not know the story, Charlotte, a spider, fools the people by writing words into her web. The people think the words are a miracle and all the words are about Wilbur, the pig. The first words she writes is "Some pig." After the excitement of the first writing dies down, she writes "Terrific." Then she wrote "Radiant." At this point the farmer decides to take Wilbur to the County Fair. The animals know if Wilbur wins a ribbon there is no way the farmer will kill him to make bacon. Wilbur begs Charlotte to come with him to the fair, but Charlotte is nearing the end of her life and must make her egg sac. 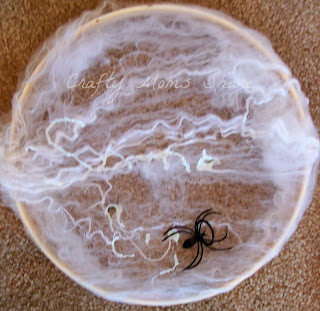 She however realizes that Wilbur will need her to be there and to write something in her web there, so she goes and gets the rat to go with her so she will have someone to run errands (like finding words). Her final word in her web is "Humble." Wilbur does not win the ribbon for best pig, but he wins something better. Charlotte knows her trick has worked and Wilbur will not be killed for food. 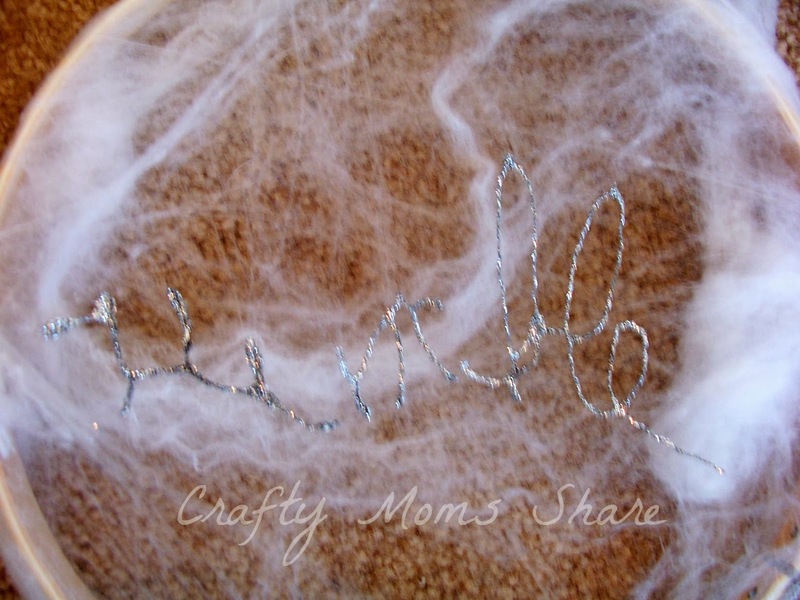 She created her egg sac at the fair and Wilbur promises to take it with him and to watch over her babies. Now our craft was to make Charlotte's webs. Awhile ago I had seen some spider web ideas using the wooden frames of embroidery hoops. (I'm sorry to say I cannot find where I saw it though--if it was on your blog, please let me know so I can add a link.) Anyway, I bought some and used one half of one for another project so we had three. Instead of using yarn, I used some of the fake spider web I got from Shindigz Party Supplies when I did my product review. 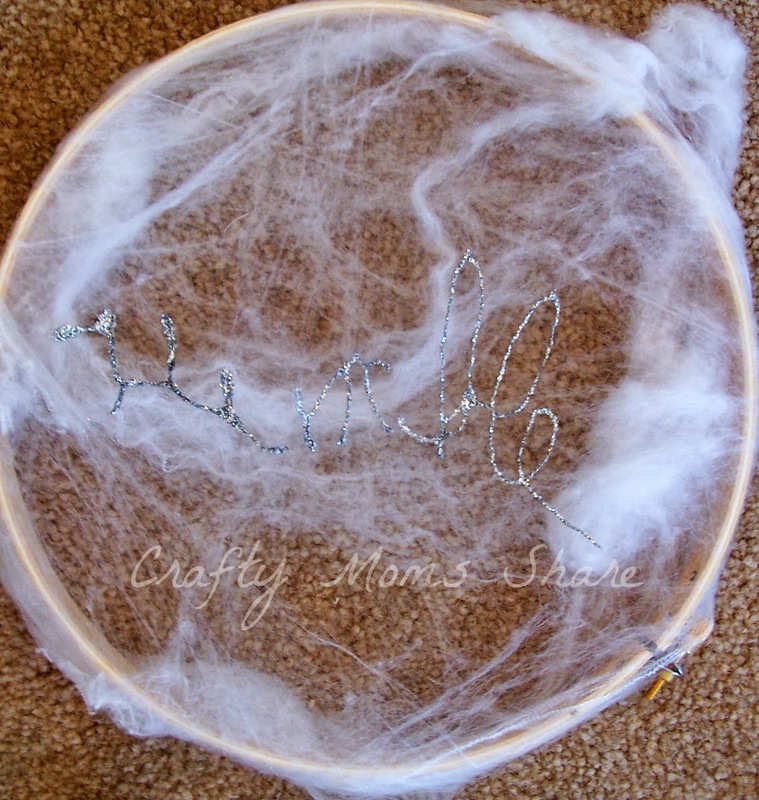 Hazel and I wrapped the fake spider web spreading it as much as we could without ripping it around the frame. Then I took Hazel's glitter glue and wrote the words and left them to dry for a few days. 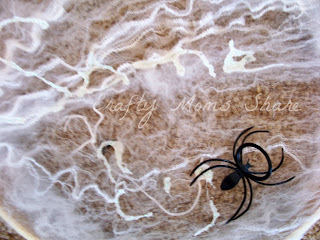 I also added a few fake spiders on them for some of the pictures. 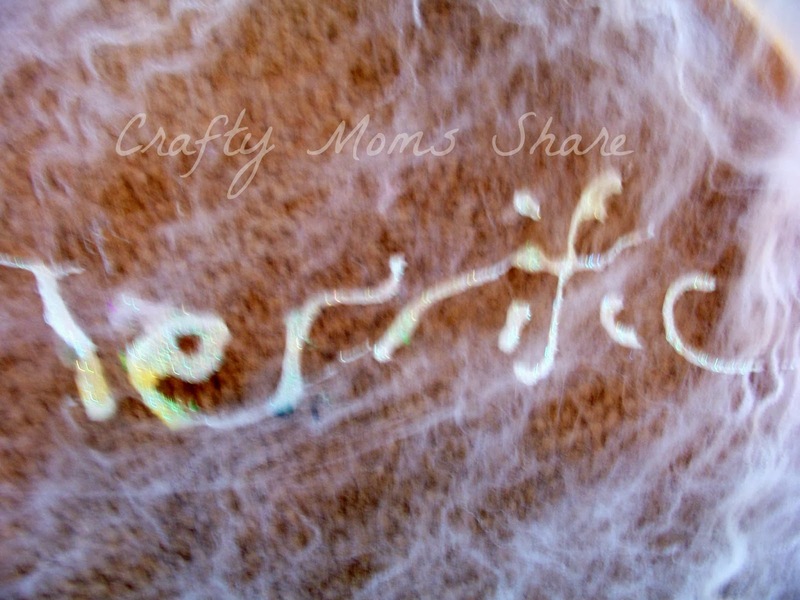 Things I discovered--it is not easy to write with glitter glue. But we like how they came out. I also liked the white glitter glue better than the silver. I was trying the light colors so it would sparkle without standing out as totally different. As you can tell in "Some pig" I was running out of the white so we had to switch to silver for "Humble." Now we are reading Little House in the Big Woods by Laura Ingalls Wilder. Another series I grew up on both in the books and television shows. And of course it was my favorite since the youngest of three girls was named Carrie just like me. Hazel picked up on that right away as well. She has decided she likes this book even more than Charlotte's Web, but that is a different post all together. What chapter books are you enjoying with your child(ren)? 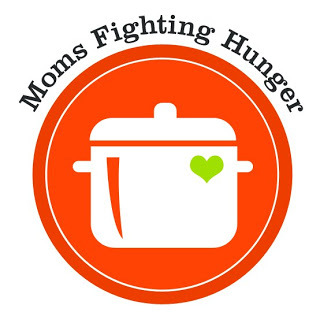 Now much of what we did for Hunger Action Month, we actually did in August in preparation. I e-mailed local public libraries and preschools with story time plans to start a food drive. I already shared all of this in August. I shared to ideas using the classic tale, Stone Soup and The Very Hungry Caterpillar by Eric Carle. 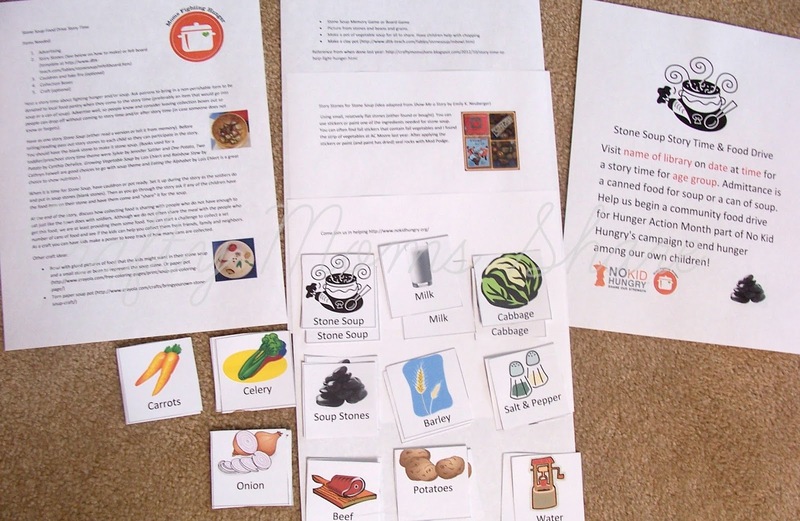 For the Stone Soup plans I used ideas from the story time food drive I helped organize at my library last year as well as a few ideas I found on-line and a memory game I made. The Very Hungry Caterpillar plan came from several blogs and things I found on-line. The original idea came from The Good Long Road. The next thing we did was to host a canned food drive at Hazel's butterfly party. Between me cleaning out our cabinets and what Hazel's friends brought we had a very full bag of food for our local food pantry. When Hazel is older I am hoping to volunteer with her at the food pantry and the local soup kitchens. I also would like to share some more books to help start the discussion of hunger with children. 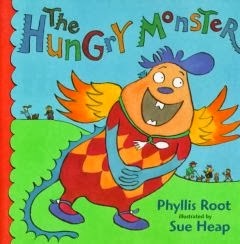 For the younger children a good short story about hunger is The Hungry Monster by Phyllis Root. This story is about an alien monster that lands on Earth and is very hungry. He tastes things he sees--a daisy, a rock, a tree, and then he sees a girl who gives him her banana (instead of him eating her) and he finally finds something he likes to eat. The girl is a little disgusted since he eats the peel and all. It is a wonderful introduction to talk about people who do not have enough to eat or enough good food to eat. The Very Hungry Caterpillar will also work for this. An activity following this discussion could be going to the grocery store and buying some food for your local food pantry. Let your child pick out some nutritious canned food and then bring it to the food pantry together. For older children I like Kids Against Hunger by Jon Mikkelsen. In this story two friends wonder why their soccer coach does not get upset when a teammate missing practice every Wednesday. 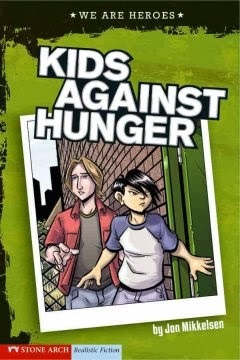 They decide to follow him one Wednesday and discover he is volunteering for an organization called Kids Against Hunger. The teammate explains that when he was younger his family went through rough times when they did not have enough to eat and now he likes to help others in that situation. The boys want to help to and suggest that they ask the coach to move their Wednesday practice to Thursday so the whole team can volunteer. It is a nice story to show how kids can help by donating their time. And of course the obvious activity with this book would be to volunteer at a food pantry or soup kitchen. To find a food pantry in your area look here. Another easy thing to do is Dine Out for No Kid Hungry. There is still five days left to have a portion of your meal donated. Just click the link to see what local restaurants are offering near you. So I hope you will join us in trying to end hunger throughout the world even if it is making a donation (food, money or time) to your local food pantry and/or soup kitchen. Also feel free to join us in this link party to share what you have done to end childhood hunger! This weekend fall began here. On Friday it was nice outside, so I decided to get Hazel outside and doing something. Now in our backyard we have two apple trees that have had many apples this year. 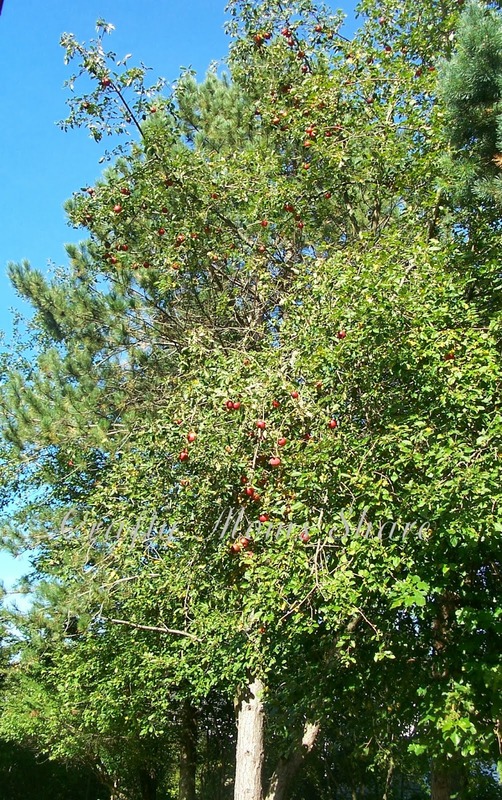 We do not pick these apples. Steve told me they were not the kind of apples you eat. After smelling them this year, I think he may be wrong. However I am not tall enough to get them and fear ladders too much to try on my own. He hasn't bothered to pick one for me and the ones on the ground do not look so good, but the deer are enjoying them. Here is one tree after most of them have fallen to the ground. Here is what it looks like on the ground. 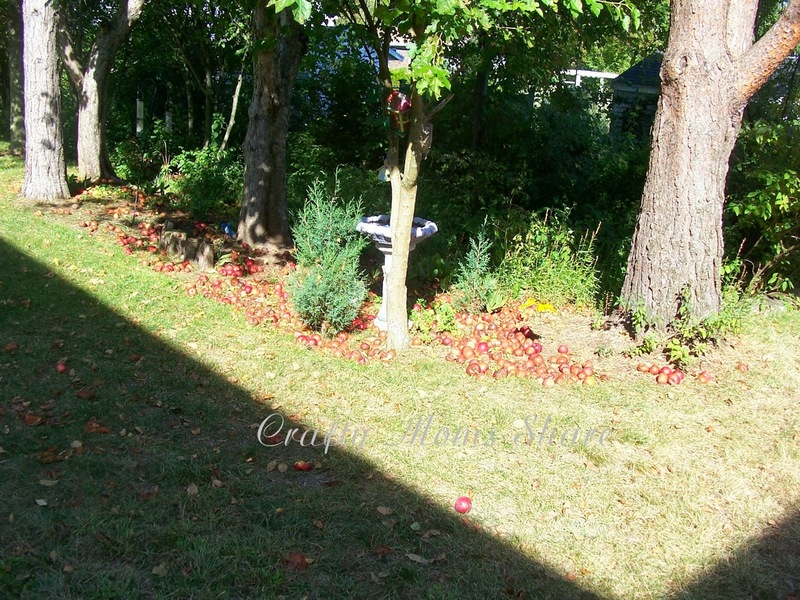 Steve goes and picks up the ones in the grass and puts them in the "garden" under the trees, so no one trips and the landscaper won't have a problem with the mower. I had Hazel look for two non-mushy ones that we could cut to make apple prints while I got the rest of our supplies. 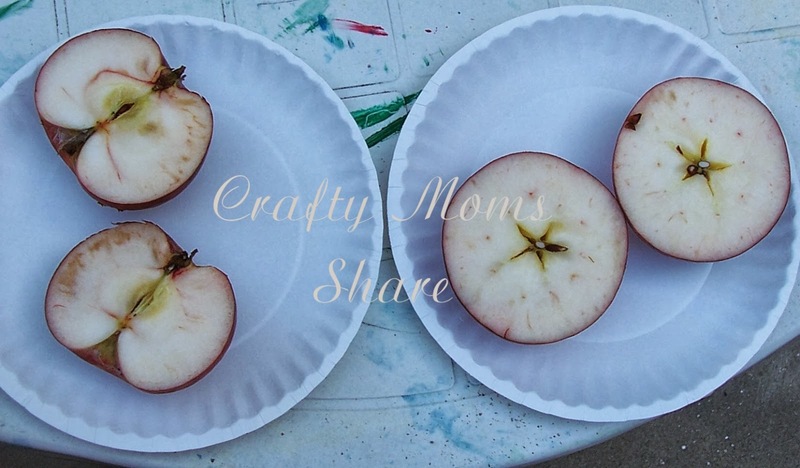 I cut one apple down the center of the core vertically and the other horizontally (so you get the star). 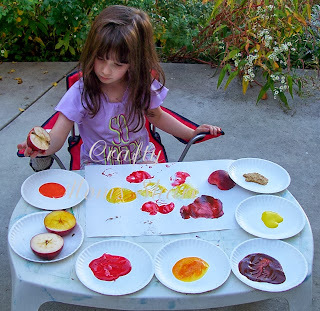 Then I gave her fall colors of paints and white paper and let her have fun. 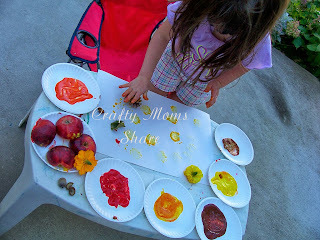 She was having so much fun with the apples, we decided to add in pinecones, acorns, flowers and leave. 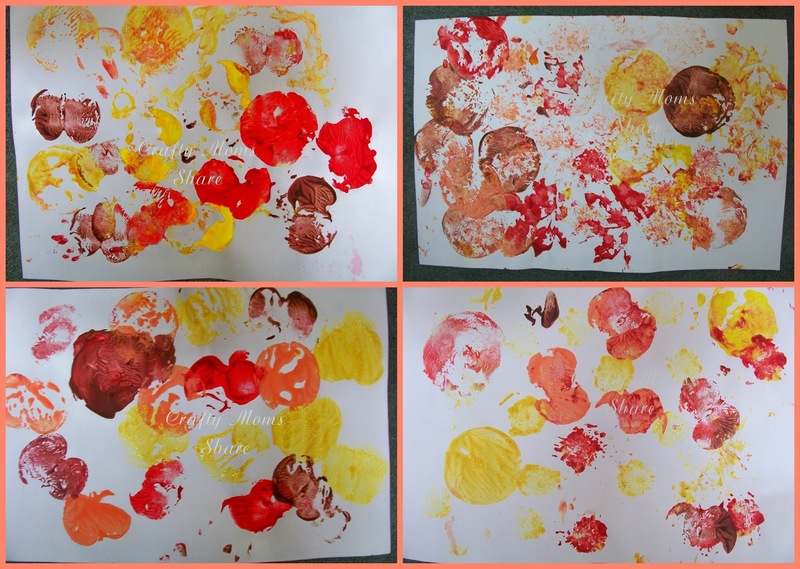 She made four nature prints. 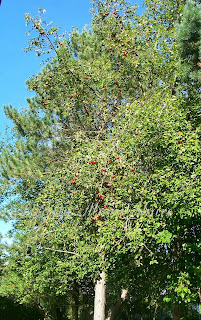 On a few you can see the stars of the inside the apples, but not too much. 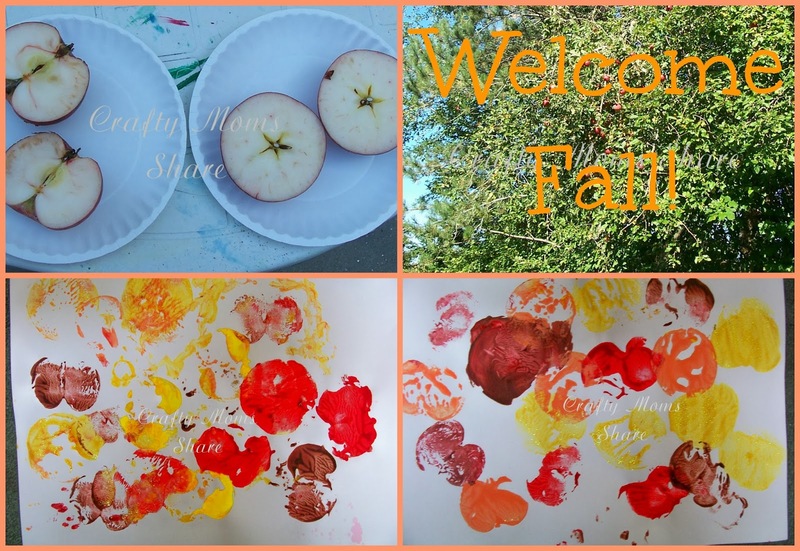 Now we have some beautiful fall prints. I was thinking of cutting them and making cards, but Hazel said she would miss them too much. We will see. How did you welcome the new season where you are? Today we are going back to Cinderella tales. The one for today is from Argentina. 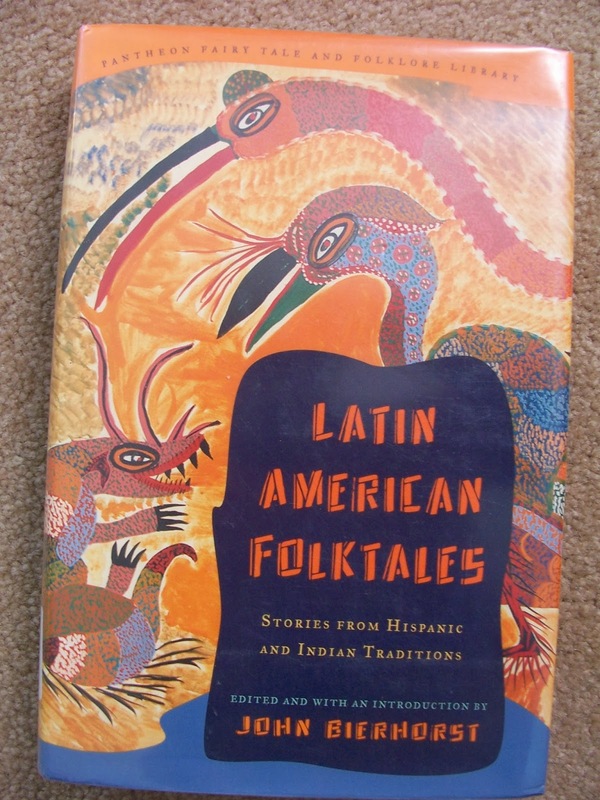 I found a copy of it translated in English in Latin American Folktales: Stories from Hispanic and Indian Traditions edited by John Bierhorst. Before we get into the tale, let's look a bit at Argentina. Argentina is located in the Southeast of South America. 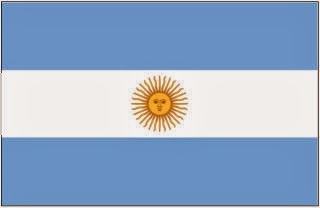 It is officially called Argentine Republic. It is the eighth largest country in the world and the second in Latin America. It claims sovereignty over part of Antarctica, the Falkland Islands and South Georgia and the South Sandwich Islands. Europeans first arrived in the area in 1502. Pedro de Mendez established a settlement in the area that is now Buenos Aires in 1536 but it was abandoned in 1541 when it was destroyed by natives. Unlike the rest of Latin America the colonization of Río de la Plata estuary was not influenced by the gold rush since there were no precious metals in the area. However, the name Argentina comes from the Latin word for silver since they explorers heard rumors of silver mountains located there. Buenos Aires was established again in 1580. After much war, Argentina claimed its independence from the Spanish rule. The climate of Argentina varies from subtropical in the north to subpolar in the south. The animals also vary greatly depending on the climate. The north has the pumas, flamingos, hummingbirds, and more and the south has seals, sea lions and penguins. The west has the Andes Mountains, so it also has llamas and mountain animals. Now onto our tale. This tale is called Rice from Ashes. 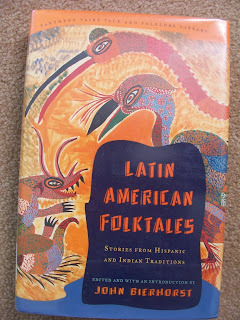 Again I found it translated in Latin American Folktales: Stories from Hispanic and Indian Traditions edited by John Bierhorst. It has many similarities to Cinderella tales we have looked at from around the world. The story begins with a girl who has lost her mother and her father remarries a woman with two daughters of her own. From the start the stepmother and stepsisters are cruel to the girl, and she only has a lamb to keep her company. One day the stepmother tells her to kill her lamb. The girl starts to cry. The stepmother takes a plate of rice and spills it into the ashes in the hearth. She tells the girl that if she does not separate each grain of rice from the ashes by the time the stepmother wakes from her nap the lamb will have to die. The stepmother goes to nap and the girl cries. A dove comes and talks to the girl. The dove tells the girl to take a nap and it will clean the rice from the ashes. The dove has a flock of doves come to help and the task is taken care of. The stepmother is angry when she awakens from her nap. The next day the stepmother pours sand into lentils for the task. The birds came back to do the task. The following day the stepmother throws sugar onto the hearth and an ant comes to help the girl. 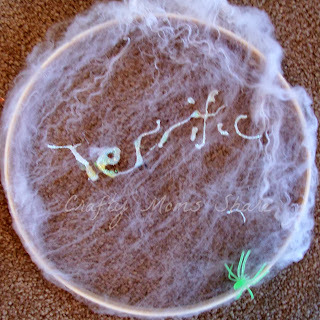 The next day the stepmother gives the girl two large bags of wool to spin. The lamb helps the girl and gets it done, however the stepmother finds one stray piece of wool on the lamb and orders her to kill the lamb. The lamb tells the girl to calm down and butcher and she will find a cup in the bowels. The lamb tells her to keep the cup forever. She does this and while at the stream, a little man comes and asks her for a drink. She gives him one with her cup. The girl misses her lamb now that she has no one to talk to. The stepsisters decide to punish her more by asking their mother to buy them lambs. The stepsisters' lambs ate all the grass and the mother insisted on butchering them. The lambs told each sister in turn not to be sad and to find the cup and to be good to others. Each one found the cup inside the lambs' bowels. The little man comes to each of them and each stepsister in turn refuses to serve the little man, who happens to be God. Now there was a prince in town whose mother told him on her deathbed that he would marry a girl with a gold cup since it had been predicted by his godmother who was a fairy at his birth. He made an announcement in town for all the young women with gold cups to be presented to him. The stepmother ran to the king to have the prince come meet her daughters with their gold cups from the lambs. When the prince arrived the two stepsisters shoved one another to be the first to present the cup to the prince. The stepmother told the older girl to show the cup. The prince saw the gold cup and assumed this was who he was to marry. The prince put her on his horse and started for the palace. Along the way a bird sang out of a tree in the cemetery that he had the wrong girl. He asked to see the cup again and it was now iron. He turned back and got the other stepsister. Again the bird told him he had the wrong girl. He looked at her cup again and it had become iron. He took her home and insisted that their had to be another girl. He searched the house and found the orphan girl in the kitchen. He asked to see her gold cup. He put her on the horse to go the palace and as they went by the cemetery the bird told him he had the right one, however he asked to see her cup again and it was still gold. The girl and the prince were married and she became a very good queen who especially was kind to orphans.